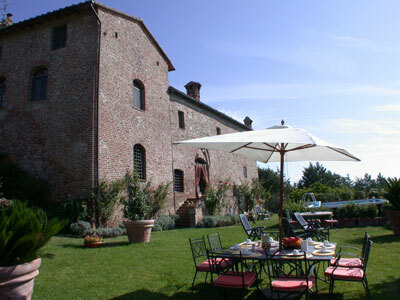 Villa La Cappella is set in the green countryside of Siena and perched upon the hill of Montesiepi. It is located between the Abbey of San Galgano and the Chapel of Montesiepi, where the legendary Sword in the Stone is kept. La Capella was built around the same period as the adjacent Romanesque Church of Montesiepi, and was to become a convent. Much later it came to be used for civil purposes. The owners have restored the building, respecting the original structure but also in keeping with the expectations of the modern tourist. La Cappella, so tastefully reconstructed according to Tuscan style and atmosphere, fits in beautifully within the historic and artistic environment that surrounds it. The momentous doorway, gives way to a double staircase leading to the spacious terrace above, from which one can admire views in every direction - the enchanting panorama or, by night, the vision of the Cistercian Abbey illuminated. One could also take a swim in the private pool or simply enjoy the relaxation of open air living. The historic Portico of the Convent, unchanged since 1250, with a Stone Well and an Oven used by the Friars to bake the day’s bread is today still perfectly functional. All of this combined with the owners’ warm hospitality make La Cappella a favourite holiday residence for a select and demanding clientele. In the nearby Monticiano you can find restaurants, cafès, supermarket and bank.